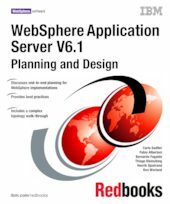 This IBM Redbooks publication discusses the planning and design of IBM WebSphere Application Server Version 6.1 environments. The content of this book is oriented to IT architects and consultants who require assistance when planning and designing small implementations to large and complex implementations. This book addresses the packaging and features incorporated in WebSphere Application Server, covers the most common implementation topologies, and addresses planning for specific tasks and components that conform to the WebSphere Application Server environment. The book includes planning information for WebSphere Application Server V6.1 and WebSphere Application Server Network Deployment V6.1 on distributed platforms and WebSphere Application Server for z/OS. It does not cover WebSphere Application Server for i5/OS.